Preheat the oven to 250°C/480“F. Finely chop shallot and garlic and set aside. Halve pumpkin and remove seeds. Cut pumpkin into equal-sized pieces and transfer to a parchment-lined baking sheet. Season with salt and pepper. Roast in the oven for approx. 15 min., or until golden brown. Rinse chickpeas until water runs clear, then pat dry. In a large bowl, mix chickpeas, curry powder, olive oil, and garlic powder together and season with salt and pepper. Heat a frying pan over medium-high heat and fry chickpeas for approx. 5 min., or until golden brown. Remove from pan and set aside. Add orange juice to a small saucepan and simmer until reduced to one-third of the original amount. Set aside to let cool. Once cool enough, add orange juice reduction, walnut oil, apple cider vinegar, chopped garlic, shallot, and mustard to a bowl and stir to combine. Season with salt and pepper to taste. Wash apples and cut into equal-sized pieces. Roughly chop walnuts. 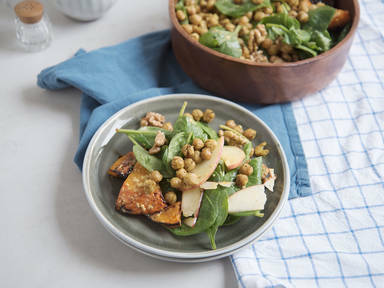 Add pumpkin, baby spinach, chickpeas, apples, and walnuts to a serving bowl and serve with dressing. Enjoy!